Netflix has unveiled the first official promotional video featuring the opening sequence of season four of Unbreakable Kimmy Schmidt. They also released five new photos from the upcoming fourth season of the critically acclaimed, award-winning comedy series. Unbreakable Kimmy Schmidt season four stars Ellie Kemper (The Office) in the title role. The cast of the award-winning half-hour comedy also includes Tituss Burgess (30 Rock, Smurfs: The Lost Village), Jane Krakowski (A Christmas Story Live!, 30 Rock), and Carol Kane (Gotham, Thanks for Sharing). Guest stars over the three seasons have included Tina Fey, Jon Hamm, Amy Sedaris, Josh Charles, David Cross, and Gil Birmingham. The popular comedy was created by Tina Fey and Robert Carlock. Fey, Carlock, Jeff Richmond (30 Rock) and David Miner (30 Rock, Brooklyn Nine-Nine) serve as executive producers. Netflix has set a May 30, 2018 premiere date for the first six episodes of Unbreakable Kimmy Schmidt season four. The Opening Sequence and Plot Description: In the scene, Kimmy (Ellie Kemper) makes her way to her first day as HR manager at Giztoob, in the style of a 90’s Main Title Sequence, complete with a soundtrack of the original song, “Little Girl, Big City” sung by the multi-talented Jane Krakowski (music by Jeff Richmond and lyrics by Sam Means). The excitement of Kimmy’s new position in life reaches a record screeching halt when she arrives to the office and her first task is to fire someone. But have no fear…it will be done the Kimmy way. Unbreakable Kimmy Schmidt follows Kimmy Schmidt as she continues to adjust to the 21st century and learn more about who she really is. Joining Kimmy on her journey are her best friend and roommate, Titus Andromedon (Tituss Burgess); her former-employer-turned-friend Jacqueline White (Jane Krakowski); and landlord Lillian Kaushtupper (Carol Kane). 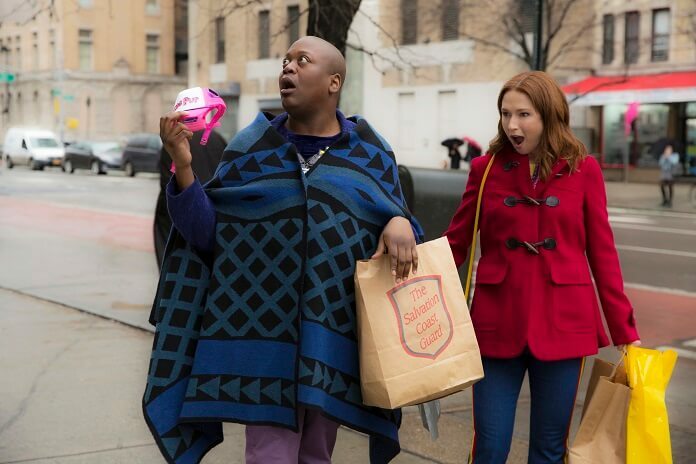 Tituss Burgess and Ellie Kemper in ‘Unbreakable Kimmy Schmidt’ season 4. Ellie Kemper, Jane Krakowski, and Tituss Burgess. Ellie Kemper in ‘Unbreakable Kimmy Schmidt’ season 4. Jane Krakowski stars in ‘Unbreakable Kimmy Schmidt’ season 4.